Good. 159 pages. Volume 1 only of the 2-volume set, profusely illus., some wear and soiling to covers. A unique and powerful tale of a Holocaust survivor seen through the art and words of his son, avant-garde cartoonist Art Spiegelman. Spiegelman won a special Pulitzer Prize and a Guggenheim fellowship for Maus. Art Spiegelman (born Itzhak Avraham ben Zeev on February 15, 1948) is an American cartoonist, editor, and comics advocate best known for his graphic novel Maus. From 1992 he spent a decade as contributing artist for The New Yorker, where he made several high-profile and sometimes controversial covers. Spiegelman began his career with the Topps bubblegum card company in the mid-1960s, which was his main financial support for two decades; there he co-created parodic series such as Wacky Packages in the 1960s and the Garbage Pail Kids in the 1980s. He gained prominence in the underground comix scene in the 1970s with short, experimental, and often autobiographical work. Spiegelman turned focus to the book-length Maus, about his relation with his father, a Holocaust survivor. The postmodern book depicts Germans as cats, Jews as mice, and ethnic Poles as pigs, and took thirteen years to create until its completion in 1991. It won a special Pulitzer Prize in 1992 and has gained a reputation as a pivotal work, responsible for bringing scholarly attention to the comics medium. This work was the winner of a 1992 Pulitzer Prize. With the intention of creating a book-length work based on his father's recollections of the Holocaust. Spiegelman began to interview his father again in 1978 and made a research visit in 1979 to the Auschwitz concentration camp, where his parents had been imprisoned by the Nazis. The book, Maus, appeared one chapter at a time as an insert in Raw beginning with the second issue in December 1980. Spiegelman's father did not live to see its completion; he died on 18 August 1982. Spiegelman learned in 1985 that Steven Spielberg was producing an animated film about Jewish mice who escape persecution in Eastern Europe by fleeing to the United States. Spiegelman was sure the film, An American Tail (1986), was inspired by Maus and became eager to have his unfinished book come out before the movie to avoid comparisons. He struggled to find a publisher until in 1986, after the publication in The New York Times of a rave review of the work-in-progress, Pantheon agreed to release a collection of the first six chapters. The volume was titled Maus: A Survivor's Tale and subtitled My Father Bleeds History. The book found a large audience, in part because it was sold in bookstores rather than in direct-market comic shops, which by the 1980s had become the dominant outlet for comic books. Very Good. Trade PB. 8vo. Pantheon. 1992. 160 pgs. Signed and inscribed by Spiegelman with a drawing on the title page. First Edition/First Printing. Wrappers lightly worn with some light shelf-wear to the extremities present. Book is free of ownership marks. Text is clean and free of marks. Binding tight and solid. The second installment of the Pulitzer Prize-winning graphic novel acclaimed as “the most affecting and successful narrative ever done about the Holocaust” (Wall Street Journal) and “the first masterpiece in comic book history” (The New Yorker). 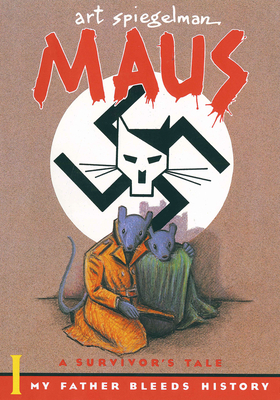 A brutally moving work of art—widely hailed as the greatest graphic novel ever written—Maus recounts the chilling experiences of the author's father during the Holocaust, with Jews drawn as wide-eyed mice and Nazis as menacing cats. E-63; 8vo 8"-9" tall; 160 pages; Signed by Author.